Order your home /commercial heating oil by phone or online. Use our easy payment facilities online. We also accept cash or we have debit or credit card facility on site and on our delivery vehicles. Rates can vary but will always be competitive with market changes. We have a fleet of vehicles which can cater for deliveries large and small and a mini tanker for deliveries or restricted access. All trucks are metered and go through regular checks by our drivers. Who are also fully qualified and trained, offering a high level of service and safety. Our Express inside and outside clean is a specialty. For only €25 you can reform your car. Having come through our “Magic Carpet” wash proceed to our specially adapted valet bay where trained staff will do the interior of the car. Includes carpet and seat vacuum – windscreen and door glass cleaned – dashboard and door trim cleaned, provide and air freshener and tire shine. The process will take 30 minutes during which you can relax in our waiting room and have a coffee. 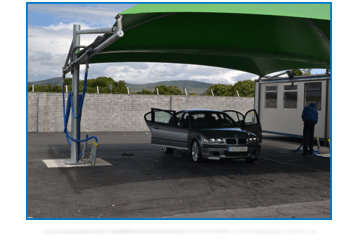 Our new state of the art hand car wash system is a semi-automated “Magic Carpet” conveyor system one of the first in Ireland. The wash is fully attended and supervised by our trained staff. The cleaning products we use are recognized quality and tested products. 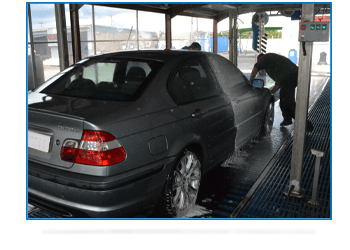 We also have a NCT under-body wash facility for cars and HGV. We also specialize in HGV washes. 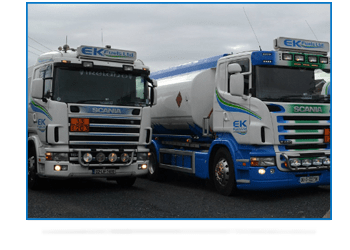 EK Fuels Ltd is a local family run business. We are proud of our forecourt service, our fuel pumps and car wash are always fully attended offering a fast, friendly and reliable service by our team of fully trained staff.